LINCOLN, R.I. (Dec. 18th, 2015) – Another fight, another highlight-reel knockout for Khiary Gray. Valenzuela showed some fight early, even taunting Gray after eating a right hand to the temple, but Gray ended it quickly with a double right hook to the body, dropping Valenzuela to one knee. Gray has fought 11 times in 18 months since making his pro debut in June of 2014 and has now won his last eight fights by knockout, including seven in the opening round. New Haven, Conn., junior middleweight Jimmy Williams (10-0-1), fighting in Rhode Island for the first time in his career, ended a 10-month layoff with a 58-56, 56-58, 59-55 win over Vero Beach, Fla., vet Chris Gray (13-22-1). 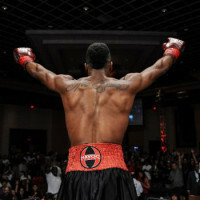 Williams shook off some early ring rust and remained unbeaten with the narrow win, his first since knocking out Eddie Caminero in February, a win that landed on ESPN’s Top 10 highlights for the night. Making his long-awaited return to Twin River after more than a year away from the ring, middleweight “Irish” Joey McCreedy (15-9-2) of Lowell, Mass., lost a bizarre split decision to Laredo, Tex., vet Emmanuel Sanchez (7-4), 57-56, 60-53, 58-56. McCreedy actually knocked down Sanchez in the opening round and won each of the six rounds on one of the scorecards, but Sanchez hung tough and earned narrow decisions on the other two cards, spoiling McCreedy’s first fight since September of 2014. Sanchez, coincidentally, was on the wrong end of a split decision in his last fight, a four-round loss to Eric Asher in Ohio in July. Fighting for the fourth time in 2015, unbeaten Worcester, Mass., junior welterweight Freddy Sanchez (7-0) closed out his season in style with a hard-earned unanimous decision win over Vero Beach, Fla., vet Chris Gray, 59-55, 59-55, 60-54. The fight featured plenty of back-and-forth action, easily the toughest test of Sanchez’s career, as Gray’s awkward style forced Sanchez to adjust throughout the fight. Sanchez improved to 4-0 in 2015, which included two knockout wins at Twin River. Training under the guidance of Rhode Island’s Jose Santos, Providence featherweight Phil Dudley (1-0) debuted at Twin River in impressive fashion, winning a slugfest against Jacob Solis (1-2) of Lawrence, Mass., by unanimous decision, 39-37, 39-37, 40-36. Dudley landed early and often against Solis, who withstood the damage and lasted four hard rounds, dropping his second consecutive decision since winning his debut in 2012. Also fighting under Santos’ tutelage, fellow Providence featherweight Cido Hoff (0-0-1) earned a 38-37, 38-38, 38-38, majority draw against previously unbeaten Framingham, Mass., native Timmy Ramos (2-0-1) in his pro debut. Hoff, who fought Ramos twice in the amateurs, dropped Ramos with a hard right in the second round, but Ramos fought back hard over the final two rounds to earn the draw on two of the three scorecards. New Bedford, Mass., junior middleweight Ray Oliveira Jr. (4-0) returned to the ring for the first time since April with a 39-37, 39-37, 40-36 unanimous decision win over Brockton, Mass., vet Antonio Fernandes (7-24-3) and Framingham junior welterweight Julio Perez (3-0) remained unbeaten with a 40-36 win on all three scorecards against newcomer Josh Bourque (0-1) of Salem, N.H.
Albanian middleweight Fatlum Zhuta (2-0-1, 2 KOs) of Anchorage, Ala., CES’ newest addition, also made a major splash in his Twin River, stopping the overmatched Deivison Ribeiro (0-2) of Brazil at the 1:47 mark of the opening round. Zhuta sent Ribeiro to the canvas twice in the opening minute and then unloaded with another barrage seconds later until the referee stopped the bout.